The Kerry bog Pony almost became extinct. 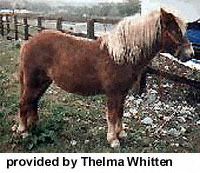 By 1994 there were only 20 ponies left in the whole of Ireland. The Kerry Bog Pony is quite small - almost like a Shetland Pony - about 10 or 11 hands high, with a distinctive dish or curved face, rather like an Arab. The Kerry Bog Pony is commonly found in chestnut, grey, and bay with a black mane and tail. To establish whether or not these ponies are truly survivors of a rare breed, the stallion Flashy Fox was tested for genetic markers by Wetherbys Ireland, and was satisfactorily blood-typed in 1994. Now the Kerry Bog Pony Society has been formed. 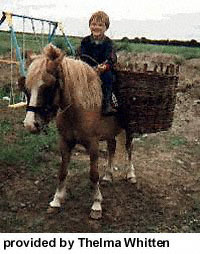 Traditionally these little ponies have been used for bringing out peat, i.e. turf, from the bogs. The original method of transporting was in baskets placed on crudely constructed wheel-less slides, which consisted of two shafts made from the holly or birch trees which grow in the bogs. Later, small wheeled carts came into use, particularly in the less boggy areas. The turf was thrown into baskets and transported by the ponies for use as domestic fuel in houses. It was about 10 years ago that Mr. John Mulvihill of Glengeigh, Co. Kerry first acquired a little chestnut stallion and recognised it almost immediately as a Kerry Bog Pony. The grandson of that pony is Flashy Fox whose dam is known as Purple Heather. Other stallions along with the Flashy Fox, Old Peat and the Bogman, are the nucleus of the breeding herd in Kerry. To symbolise the pony's link with the heritage of the bog, these ponies are named after bog flora and fauna. As well as those named above The Badger Queen, Bog Cotton, the Brave Badger, Bog Oak, are just some of the names.